The Catholic Diocese of Maralal’s Radio Mchungaji, which means The shepherd, is the eleventh Catholic radio station to go on air and to be established by the Kenya Conference of Catholic Bishops (KCCB) through the Commission for Social Communications and the conference’s Waumini Communications Company. This is line with Waumini’s mission to have 20 radio stations by the year 2020. 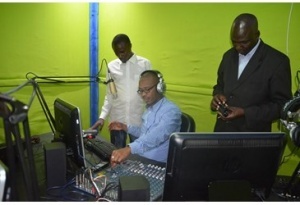 Broadcasting on 95.4fm at a radius of 150 Km, Radio Mchungaji which is currently airing Nairobi’s Radio Waumini programmes is to have its own programming in Swahili, Samburu, Turkana and Pokot languages. The radio aims at promoting human and pastoral development, supporting peace-building and community empowerment; strengthening the Catholic faith in the Diocese of Maralal and facilitating awareness creation on projects managed by the Catholic dioceses of Maralal. At the beginning of September 2016, Waumini Communications team led by the Managing Director, David Omwoyo conducted a one-week training session to equip the new radio personnel with broadcasting skills so as to reach out to the people of Maralal and Samburu counties in a more professional way. Situated in northern Kenya, Samburu county is classified among Kenya’s Arid and Semi-Arid Lands (ASAL). The area is inhabited by Samburu, Turkana and Pokot communities that practice pastoralist livelihoods. The region has an estimated population of 223,947 people. According to a Caritas Maralal report, Samburu county has a long history of marginalisation embedded in policies and practices of social, economic and political exclusion that reflect inadequate service delivery, poor infrastructure, high rates of illiteracy and morbidity.